Our kitchen garden is slowing down slightly with Autumn now well underway. Our herbs sage, rosemary, marjoram, thyme, sweet cicely are still abundant and we’re looking forward to our angelica and horseradish harvests soon. Jerusalem artichokes will be fabulous and our late plantings of carrots and leeks are doing nicely. Growing a garden is like my laundry room, regardless of how much I get done there is still always loads still to do. The team have the top bed covered in natural leaf mulch to protect it over the first frost so this looks quite a contrast with its autumnal auburn coloured leaves neatly scattered all over the bed. Meanwhile, the neighboring bed is getting ready for our latest exciting purchases. We’ve brought in Victoria Plums, Conference pears and Quince trees to bolster our baby orchard at the top of the garden. It’s very exciting. 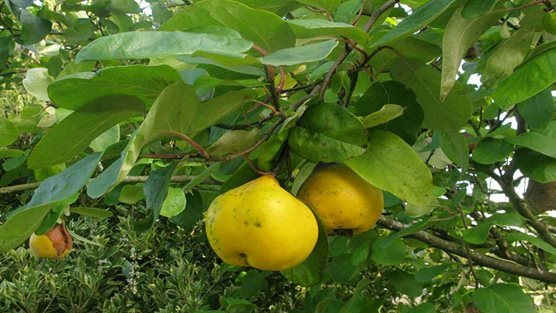 The quinces in particular are a wonderful fruit for us to start growing. There are many gardens dotted around Edinburgh that have these very unusual, quite bitter pear trees growing in their gardens and have no idea what to do with them. More often than not they are left to rot and don’t get used and appreciated for their fabulous and very distinctive taste and uses. They can be used in tarts or to make jam and make a great addition to stews to create a very different and delicious contrast. We’ll have to wait a few years for any decent fruit but I know it will be worth it. There isn’t a foodie in the land who hasn’t been following the tragic story of the Errington cheese company. We’ve known Humphrey and his family for almost 30 years. We remember the Christmas in the 1990’s when this beautiful family lived through hell when their cheese was banned from sale due to a food scare associated with raw milk cheese production. After a very long and costly legal battle they won their case and managed to save their business. Twenty years on and they are again battling the food standards authorities. Countries like France and Italy have been championing raw milk cheese production for year. If some people had their way we’d be eating 20 tablets a day with no real connection to our food chain or ecosystems biodiversity. Raw milk cheeses not only taste amazing, they are part of our heritage both culinary and culturally. Our food system needs producers like Errington to keep us all well and safe. They also provide quality, skilled employment in Scotland’s rural communities. So much is at stake. Bureaucracy and artisan food producers don’t often sit well together and in this case they really have struggled and fought for years. We really can’t let Goliath beat David. Food writer Joanna Blythman has started a campaign to support the Errington’s. We are giving it our support.